This puzzle, called the Three Piece Burr Cube 50 was designed by my friend Frank Potts so I knew straight away that it would be good. The very fine craftsmanship was by another good friend Johan Heyns who has made quite a few puzzles for me over the last few years and every single one has been beautiful and a really fun challenge (a good few have been in my top 10 each year). 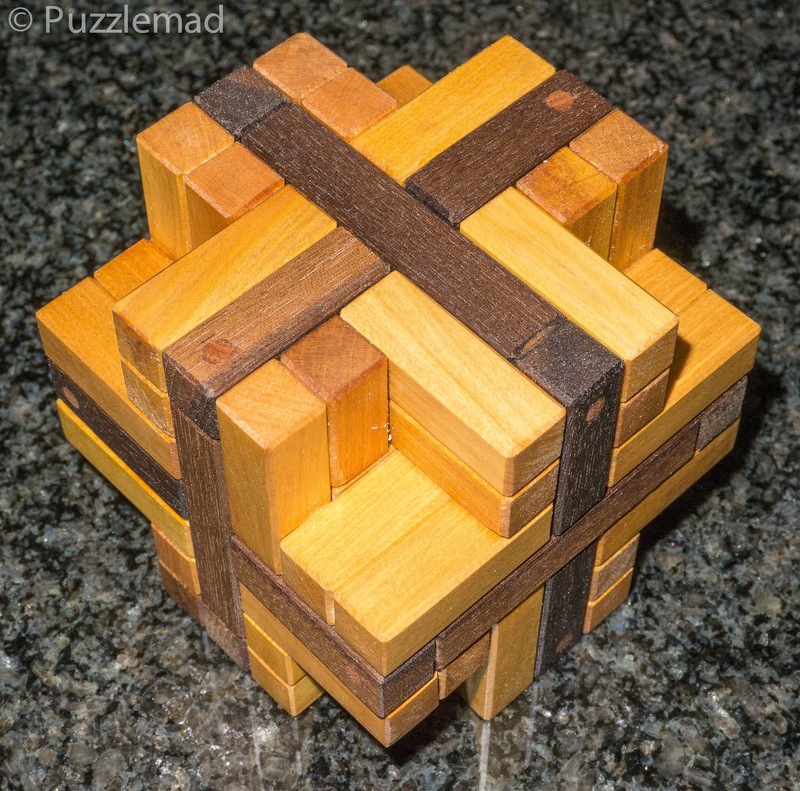 Johan has opened his own on-line store selling puzzles and beautifully turned pens - you should definitely add the store to your list of puzzle links. 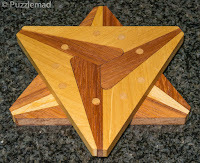 This particular "cube" was one of his recent offerings and is a very reasonable price at $55. This for a 7 piece puzzle 85mm across each side and very attractively made from Mansonia and Yellowwood (indigenous to South Africa). Of course, it wouldn't be a puzzle from Johan if it didn't come with a stand and it will be going into my dining room display of Heyn's puzzles. 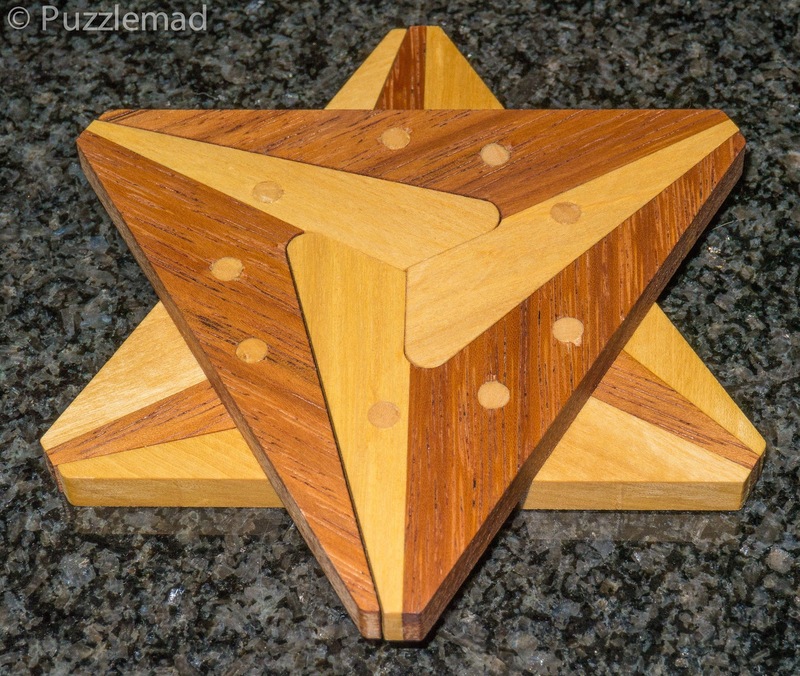 This puzzle immediately took my attention because it is just the right difficulty level and also because it is 2 puzzles in one. 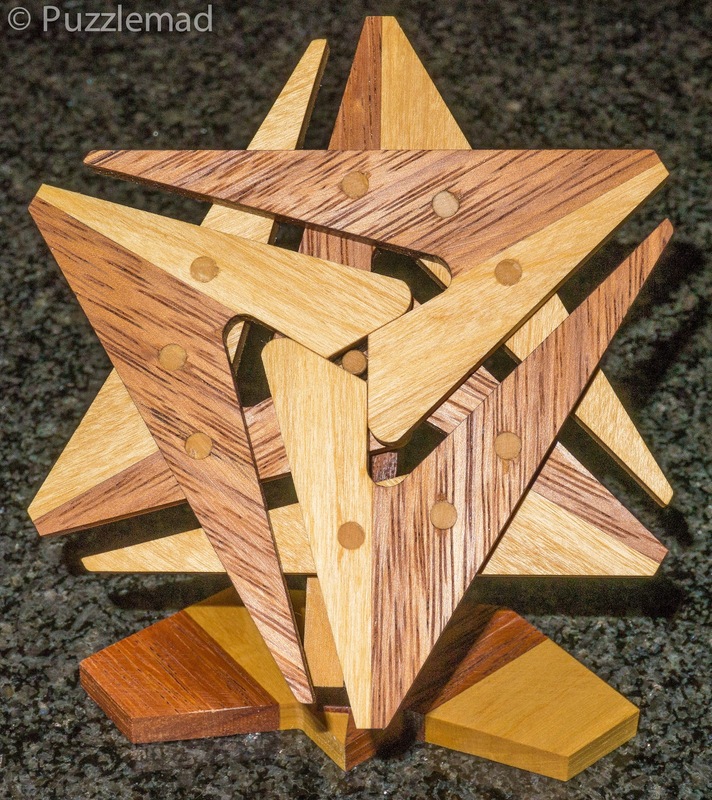 The cube itself can be disassembled with a level of 7.12.5.8.15.3 (totalling 50 and hence the 50 in the name) which is perfect and then the central 3 board burrs can be assembled into a cross with a stunning level of 24.3 - how could anyone resist? I started on it in my customary armchair complete with cat and TV on in the background and discovered a few moves quickly which were rather interesting and led to the removal of the first of the corner pieces. I wondered whether it was going to be too easy. I backtracked to the beginning and started again. Yes that first piece was quite easy but......the next piece definitely wasn't! I fact I stumbled around for the whole evening without being able to find the correct sequence. Now I was really pleased - I did want a challenge after all. It took me another whole evening before I finally found the route to the next piece. There is a very well hidden move amongst that 12 and I really struggled to find it. The aha! moment was wonderful. I did think that it would get much simpler after the second piece was removed but again I was stumped for a while. There are only a further 5 moves and my dimness showed through as it took me an hour to find them. Removing the last of the corner pieces should have been really simple but it required a lot of setting up to open a space for the piece to come out. This time I was able to plan my sequence but still got stuck for a while. At this point there are just 3 board burr pieces left intertwined and interestingly it requires another 15 moves to separate the first one and yes I seriously struggled! It took a whole extra evening! I could have done it quicker as there is a rotational exit for one of them but it doesn't happen by accident. 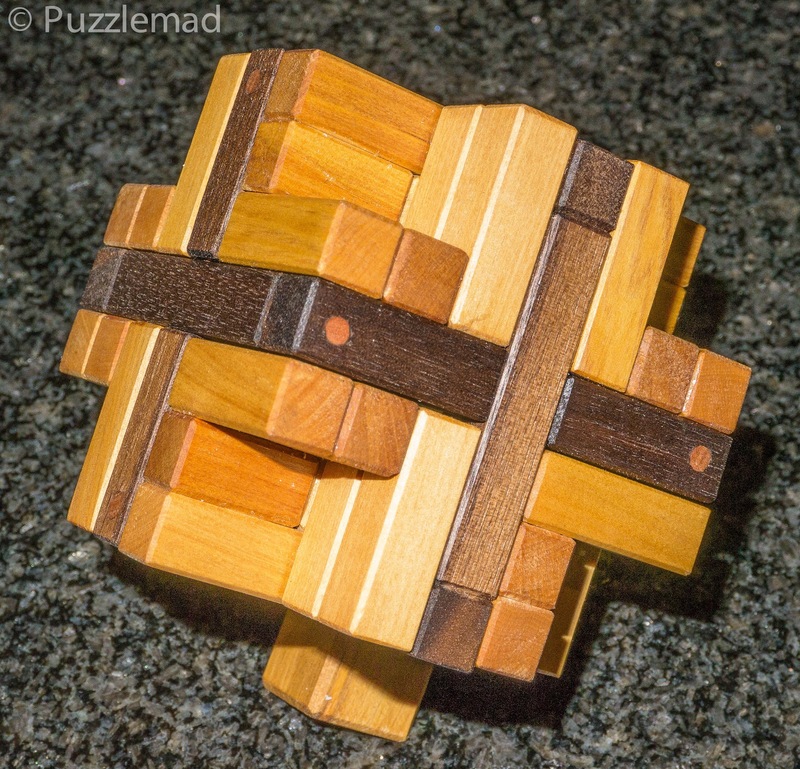 After 3 whole evenings of work (Mrs S said that this was a 4 'Plug face' out of 5 puzzle. Finally it was time to reassemble the cube and the moves during the disassembly caught me out again. I really struggled to find the sequences and for a while contemplated Burrtools. At that time, however, the cat was far too comfortable to let me get up and go to the study to enter the shapes into that wonderful program. I forced myself to keep working on it and after a fourth evening actually managed to put it all back together. 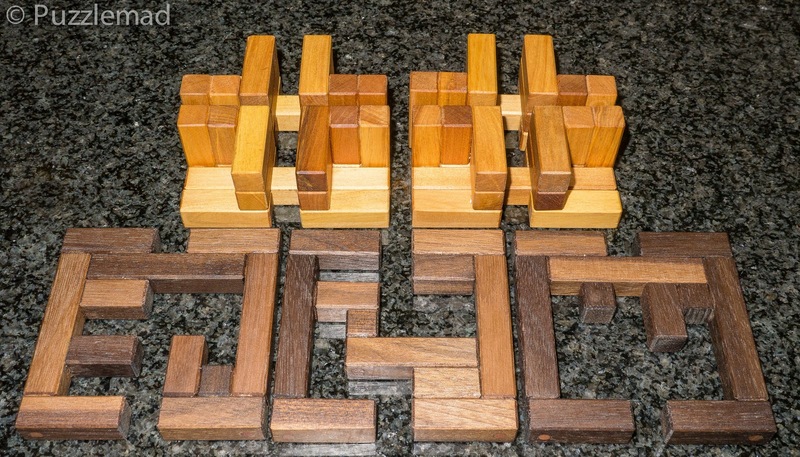 This puzzle is really really good - just the right difficulty level that you don't need to use BT to solve but still tough enough to keep you challenged. Johan made a dozen of these and at the moment there are still a few left. There has also been a recent new offering which i have not tried yet but looks lovely. In Brian Menold's last update he released a whole lot of fabulous toys for us. The cream of the crop for me was the Tronc commun 3 which I reviewed last month but I couldn't resist another one from him. I love board burrs and have bought almost all of those that he has produced but I also love framed burrs. This time around my eye was drawn to something that looked quite simple - the T burr designed by another friend, Yavuz Demirhan, who has recently been recognised for his skill with a short film that was aired on Aljazeera TV Turkey. 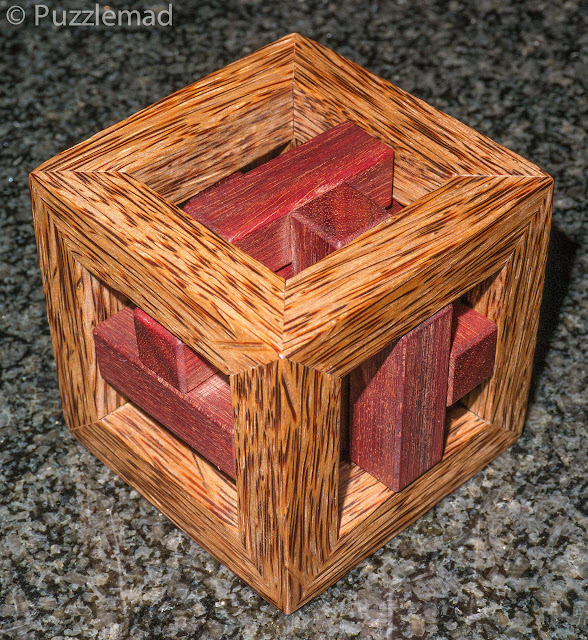 This particular one caught my eye because it was framed and also so beautiful having been constructed from Red Palm and Bloodwood. 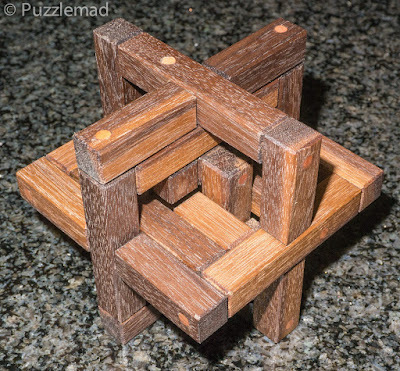 "I had to make this design because I thought that a simple frame with no obstructions and three identical pieces that simply had a perpendicular piece added to the end could not be that difficult. 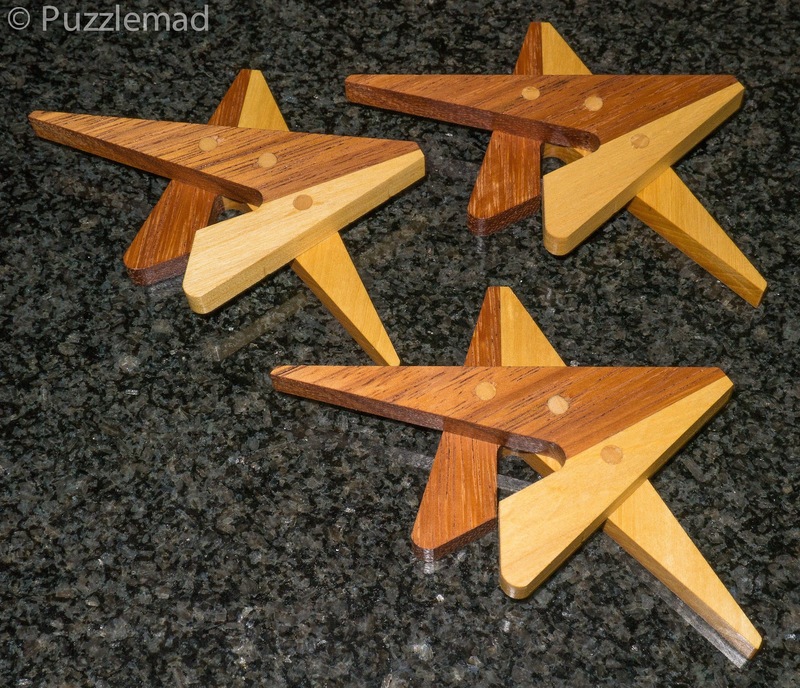 Well it did take me a bit of time to assemble these, as I tried the first 2 without cheating (something I rarely do for time sake) I was surprised that it took me so long to get them together. Now, it is not a very difficult puzzle for most of you, but it will give the beginner a run for his money!" Just look at that wood! Stunning! After this I immediately tried to reassemble it. 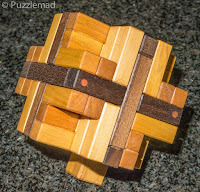 No need to scramble as all the pieces are the same and no need to wait because I really had no idea how I had got it apart. It is only 3 simple pieces so how hard could it be? OMG! I'm either really not terribly bright or this is quite a challenge. I couldn't put it back together! A whole evening of effing and blinding got me nowhere! Brian seems to think that this is not difficult for most of us puzzlers but I think he is forgetting how much experience he has developed over the years. This may be simple for some of the burr geniuses out there but for us mere mortals, this is a very nice challenge. The following day I managed to assemble it by working it out step by step. I still struggle to solve it now despite having done it 4 or 5 times - I've not memorised the solution and have to work it out from scratch each time which still proves to be a challenge! 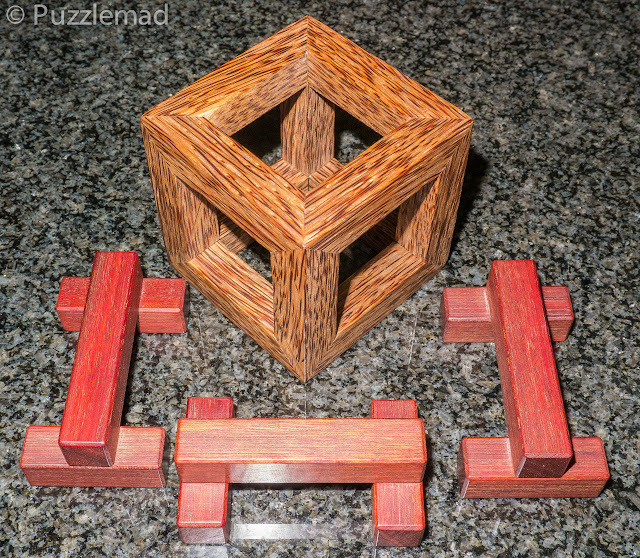 Brian is updating his site with new puzzles today (April 23rd) so be sure to have a look at what he has available and don't forget to visit Johan's site for some of his beautiful work.